Super-Team Family: The Lost Issues! 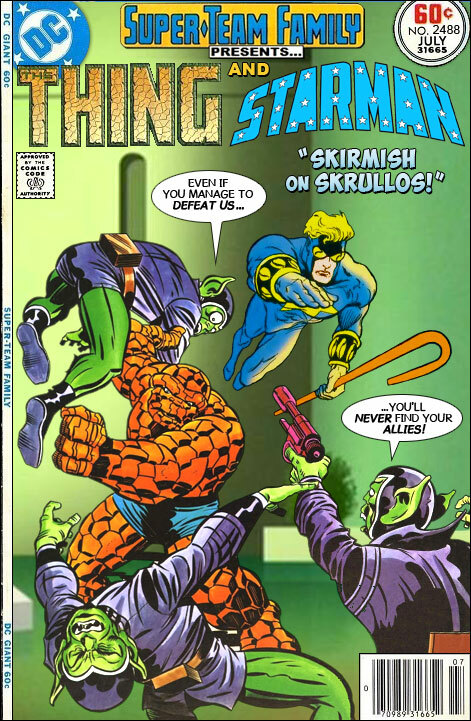 : The Thing and Starman in: "Skirmish on Skrullos!" It looks like Starman is back at DC, at least in his Will Payton form. Since that version was revealed to be a transformed Prince Gavyn, I wonder if he will be assuming his Jim Starlin-designed look again eventually. I hope so, I always loved the blue and gold outfit that he sported. Never saw that Starman design before. Looks kinda Booster Goldish to me. *One-time sidekick of the Golden Age Blue Beetle (Holyoke Comics). I remember liking the Will Payton Starman when it came out around 1990. I do wonder if anyone knows did the original creators of the Will Payton Starman mean for him to be an incarnation of the Prince Gavyn or was that reconned in by a later author? Inquiring minds want to know! It was definitely a recon. James Robinson wanted to tie all the various Starmen as close together as he could, and have his Jack Knight Starman meet all the non-dead ones. So he sent Jack on a inter-galactic road trip, and dropped the Gavyn/Payton bomb in the middle of it. Right now the recently returned Starman does not have anything to with Prince Gavyn. @ROSS My favourite STARMAN & "Rocky" Grimm Space Ranger! I approve. The Space Hobgoblins from S.K.R.U.L.L. E.M.P.I.R.E. Ltd. Unfortunately, for them, however, they'll prove no match for "The Agents of A.U.N.T.I.E." Is it me, or does it look like Starman is wearing Quasar's Quantum Bands? Anonymous From The Ever-Lovin' Blue Eyed P.E.T.U.N.I.A section of course. Maybe Quasar and Starman need to have a bar chat about equipment sources. @Brother Barnes: actually, that was a pun on "The Man From U.N.C.L.E." first used in THE MIGHTY CRUSADERS v.1/#5 (Archie Comics circa 1966). And it stood for "Amalgamated Universal Network To Inhibit Evil." That's one of the other reasons I love this site. I learn something new everyday! You're Auntie You're Auntie Social! Which, I guess, would make her "Auntie Matter." And, in self-defense, I must call upon my Auntie Mistle-mistle for help!